Evra is a contraceptive patch that is as effective as the contraceptive pill. Evra provides women with an alternative to the pill, which protects you against unwanted pregnancy. Evra can be an easier form of birth control for women as it only requires one patch applied to the skin per week. The Evra transdermal patch is a thin, sticky, tan coloured plastic patch that adheres to the skin. The patch contains the following hormones: progestin and oestrogen. These hormones are absorbed through the skin and into the bloodstream stopping you from becoming pregnant. The amount of hormones delivered through the skin is higher then that of the contraceptive pill. Evra is applied once a week for 3 weeks followed by a 7 days break. During the 7 days you will experience your period just like you would if you were taking a contraceptive pill. Evra contains 2 active hormones – oestrogen and progestogen, which are released into the bloodstream preventing you from falling pregnant when applied to the skin. 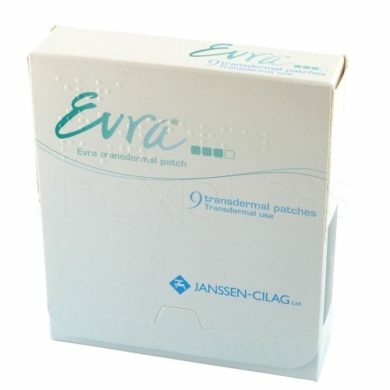 Evra transdermal patch is a thin, beige, plastic approximately 5cm by 5cm that sticks to the skin. It’s made up of three layers, the outer layer is water resistant and should remain in place while you shower, exercise or whilst swimming. Each patch is sealed in a pouch that protects it until you are ready to wear it. Can I purchase Evra Patch online? Yes, first you must complete a free, short consultation online with our doctor to buy Evra contraceptive patches. This is confidential and a free process that replaces the face-to-face appointment that you would normally undergo to receive a prescription medication. The medication will be sent from our pharmacy to arrive to you once the online doctor has approved you the medication. I been on evra patch for a year now, no specific mood swings no spotting, normal periods as 7 days, period only starts on 3rd day after removing patch and overlap by 3 days! Breasts have grown I might say a cup size. Some of periods I had very bad back pain some I don’t even feel ( so I don’t think is anything to do with patch) I have not gained much weight and I think it’s nothing to do with patch. If I eat like pig I get fat if and if I cut down on carbs I slim down. I’ve been on the ortho evra patch for 4 years now and I’ve never had any problems. I was originally put on the patch to combat hormonal mood swings, severe cramps and an irregular period. Since then, my period comes 3 days after I remove the patch and lasts till I put on my next (3-4 days). I’ve never had any spotting or bleeding throughout the month and my weight has never been affected. My mood is also very stable and I get virtually no cramps/aches on my period. I would highly recommend the patch to anyone. I’ve been on the Evra patches for almost 15 years. The first few times I used them was a bit trial and error with regards to staying in place and sticking to my clothes. Never had any problems with weight gain. I love how I know exactly what day I will start my period, which is a round 3 days after I’ve removed my patch and lasts for about 3/4 days, is a light period with no cramps or pains whatsoever. They are a natural part of life. Absolutely the best thing ever invented. Will be coming off them shortly due to getting sterilized. But they’ve honestly been a god send!